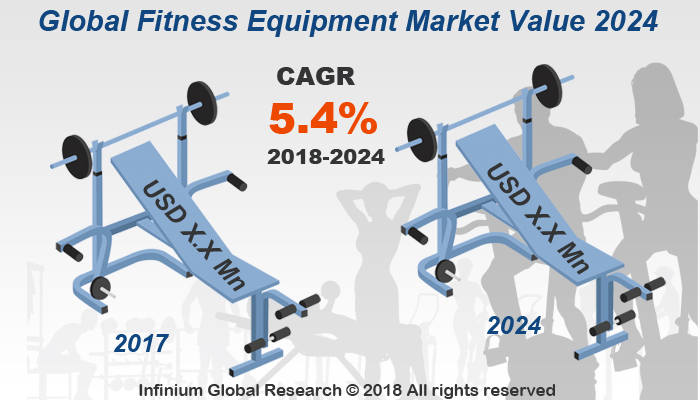 A recent report published by Infinium Global Research on fitness equipment market provides in depth analysis of segments and sub-segments in global as well as regional fitness equipment market. The study also highlights the impact of drivers, restraints and macro indicators on the global and regional fitness equipment market over the short term as well as long term. The report is a comprehensive presentation of trends, forecast and dollar values of global fitness equipment market. According to report the global fitness equipment market is projected to grow at a CAGR of 5.4% over the forecast period of 2018-2024. Fitness equipment are those types of equipment, which are used for physical workouts to manage overall weight, increase physical stamina, and develop muscular strength. The most commonly used cardiovascular equipment are treadmills, elliptical and stationary bike. They stimulate the heart rate, help in burning excess body fat and maintaining the overall health and fitness. Strength training equipment are used to gain muscular strength and improve one’s appearance and personality. They comprise free weights and other strength machines. Global fitness equipment market is showing a positive trend of development around the globe. There are many factors which are indicating a positive outlook of the market for medium and long term. Factors such as rising urbanization in developing countries, increasing obese population, increasing white color job/official job is reducing time for physical activities, growing health awareness among working population, working women and house wives are driving the fitness equipment market globally. However, high cost of fitness equipment, lack of post-sale service of fitness equipment, unavailability of good trainers are key restraining factor for the market. As the urbanization, white color job is increasing in developing countries, due to the major focus on the service sector by the governments, the demand of health clubs, gym, and physical activities centers will grow, the demand of fitness equipments would grow automatically. On the basis of region, the global fitness equipment market is segmented into North America, Europe, Asia, and the Rest of the World (RoW). North America is leading market of global fitness equipment market, due to rising obesity problem among all age group, increasing health consciousness, increasing number of health clubs and memberships are the major reason for the growth of fitness equipment market in this region. Asia region is expected to grow at the highest CAGR during the forecast period of 2018-2024, due to increasing health awareness among youth and adult, increasing disposable income among men and women, reducing time for physical activities, and societal effects would drive the market in this region. The report on global fitness equipment market covers segments such as, by type and by end user. On the basis of by type the global fitness equipment market is categorized into cardiovascular training equipment, strength training equipment and other equipment. On the basis of by end user the global fitness equipment market is categorized into home consumer, health clubs/gyms and other commercial users. The report provides profiles of the companies in the global fitness equipment market such as, Icon Health & Fitness, Inc., Brunswick Corporation, Johnson Health Tech Co. Ltd., Technogym S.p.A, Amer Sports Corporation, Nautilus, Inc., Core Health and Fitness LLC, True Fitness Technology, Inc., Impulse (Qingdao) Health Tech Co. Ltd. and Torque Fitness LLC. The report provides deep insights on demand forecasts, market trends and micro and macro indicators. In addition, this report provides insights on the factors that are driving and restraining the global fitness equipment market. Moreover, IGR-Growth Matrix analysis given in the report brings an insight on the investment areas that existing or new market players can consider. The report provides insights into the market using analytical tools such as Porter's five forces analysis and DRO analysis of fitness equipment market. Moreover, the study highlights current market trends and provides forecast from 2018-2024. We also have highlighted future trends in the fitness equipment market that will impact the demand during the forecast period. Moreover, the competitive analysis given in each regional market brings an insight on the market share of the leading players. This report will help manufacturers, suppliers and distributors of the fitness equipment market to understand the present and future trends in this market and formulate their strategies accordingly.